William Cowle (1819-1899) was a local grocer who invested his profits in land and property. Elected to the town's Local Board of Health, his uncompromising obstinacy exasperated the members but delighted the voters for more than thirty years. In his 70s he retired to live in the house on Park Road he had commissioned, in the centre of The Field estate - the new suburb he had designed and financed. the complicated story of his many Wills and his bequests to the town. 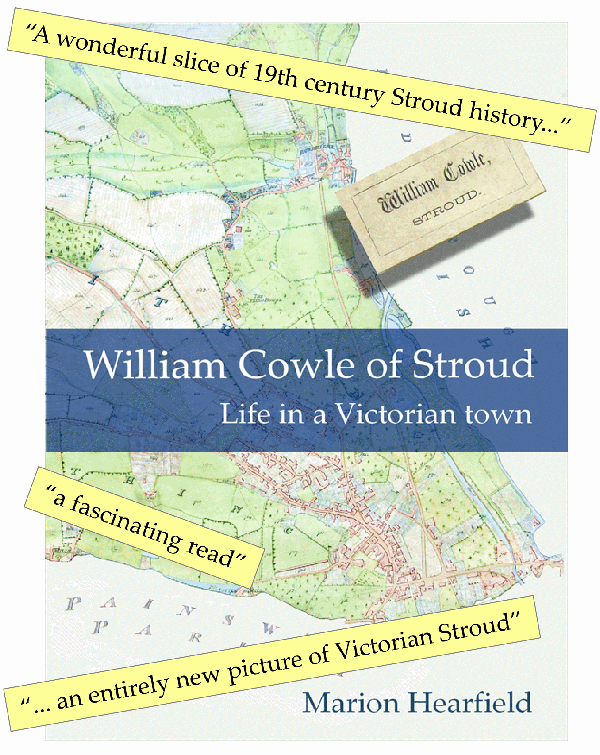 The book is published by The Friends of the Stroud District Museum and distributed by Stroud Local History Society. If you cannot visit the local bookshops you can place on order online. Please email: books@stroudlocalhistorysociety.org.uk and give your name and full postal address. We will send you an invoice via PayPal, in the currency of your home address, with details of postage and in the currency of your country. You can choose to pay from your PayPal account or by credit card and the book will be posted to your given address. All orders will be acknowledged quickly and completed promptly, and proceeds from the sale of this book will be donated to the Museum's learning programmes and teaching resources for local schools, via the Stroud Local History Society. Post Script April 2014: Sales of the book have so far raised over £1,000 for the museum. The exhibition at the Museum in the Park - The Cowle Legacy, 1st - 27th October 2013 has been generously supported by the Langtree Trust, Stroud Town Council, Stroud Freemasons, and the Stroud Local History Society.